There has been an achievement in Nicland this week, or it feels like one to me at least. I’ve managed to spend my first full night in my night splints since I got given them a while ago! At first I couldn’t wear them for a whole night because I can’t put them on for myself so I would have to take them off again if I needed to get up in the middle of the night for anything. Then I took them back to the hospital and got some walking grips put on the bottom so I wouldn’t need to keep taking them off. Even after I’d had the grips put on, it still took me some time to be able to wear them for a whole night because I had to build up wearing them for longer periods of time slowly by a couple of hours at a time until I got used to it. Now, I’ve finally done it! I was pretty surprised when I woke up the next day and found that they were still on. Hopefully I’ll be able to do this most of the nights that I wear them now. Congrats on the achievement. Great days are great days! That’s great!! I find it more comfortable sleeping with my night splints than without – especially my leg gaiter. I find that not only does it give me a great stretch, but it keeps my left leg (which is my more affected) where I want it and stops it tightening up into uncomfortable positions. Have you noticed the difference in the tightness? I have actually. My ankles don’t feel as tight now I’ve been wearing them for longer. My mum’s been helping with the stretches since I had the Botox last week as she says it doesn’t feel as tight when she stretching me either. My left side is my more affected side too. I’m not at the point where I find it more comfortable to sleep with them on yet but I always feel like I’ve had a really good stretch when I take them off again. Yeah it is 🙂 Wow, wearing afos and gaiters together while doing the ironing sounds pretty impressive! I like building physio into my daily routine as much as possible. Ok you two, you have me intrigued – what exactly is a “gaitor” as opposed to an AFO? Have heard of a gaitor walker which is a walking frame but it sounds like you are talking about something you wear? I am very interested to hear about / see what this gaitor is if you don’t mind sharing? A gaiter is a type of splint very similar to a knee immobilizer, it’s basically a piece of material that wraps round your leg from just above the ankle to the top of your thigh. It has metal strips either side and behind the knee that run the length of it. It’s used to keep the knee straight. you can also get them for arms as well. I use mine to give my hamstrings a good stretch and to keep my knee straight when standing or doing exercises. They are widely used here in the uk for people with cp. I also sleep in mine to give my hamstrings a good stretch, plus I actually find them more comfortable to sleep in than without as they keep my legs where I want them and not pulling into uncomfortable positions!! I use mine with my afos to give a really good stretch on my hamstrings and calf muscles. Ohhhhhh, thanks. I think these might be what we call “leg bands” or “immobilisers” over here??? Not sure but sounds the same. We use them to do hamstring stretches too. The ones we have use are material with Velcro straps that wrap around them to keep them in place. 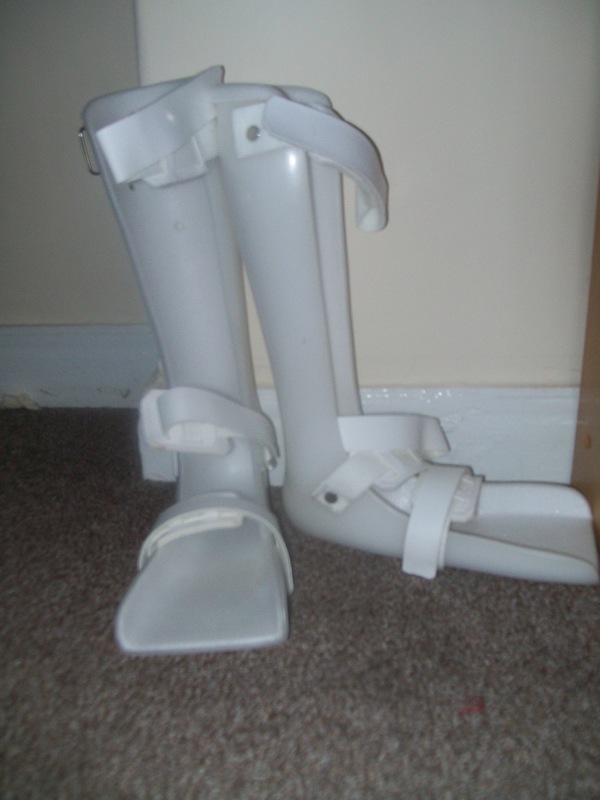 I know another person that has something that is like an AFO that extends right up to the thigh to help immobilise knee but I have been told we could only get one of them after surgery. Ahaaa, yes KAFOs that’s the ones that I think we are allowed for post surgery. I know what you mean about the ones that have a gap in the knee. This is an issue for us too and exactly the same thing re fighting it and bending it 😉 . If you get a chance some time I would like to see a pic of these gaitors and immobilizers to check out if same. Right now we are just doing sand or rice bag weights on knees when sitting with straight legs until we work out surgery for contractures. Our leg bands (immobilisers) only have 3 Velcro straps and I find she can pretty easily still bend knee (especially with the gap where the knee is) so don’t really work (at least for now). Its funny, but I didn’t really think about the fact of still having to use these same things later in life. If anything I’m using them more now as I have adapted my exercises so I can get a stretch while doing other things, like wearing my gaiters and afo’s while sitting on my laptop or watching tv so I get a good stretch but it doesn’t take too much time out of my day. I also use sandbag weights to act almost lie an extra pair of hands because it’s hard for me to get people to spare the time to help me with stretching everyday. I also use a peanut physioball that I sit on like a horse to get a good stretch. If you google leg gaiters cerebral palsy there some pictures. Hi guys sorry I’m a bit late into to the conversation! I’ve been on holiday but reading these comments has been really interesting. I think I still have my old leg gaiters somewhere so I’ll try find them and take photos.